Our annual outing with Dysart appeared this week, last year’s (No 4266, Special Protection) being based on a Stanley Baldwin quotation about flowers, wild birds and Prime Ministers. 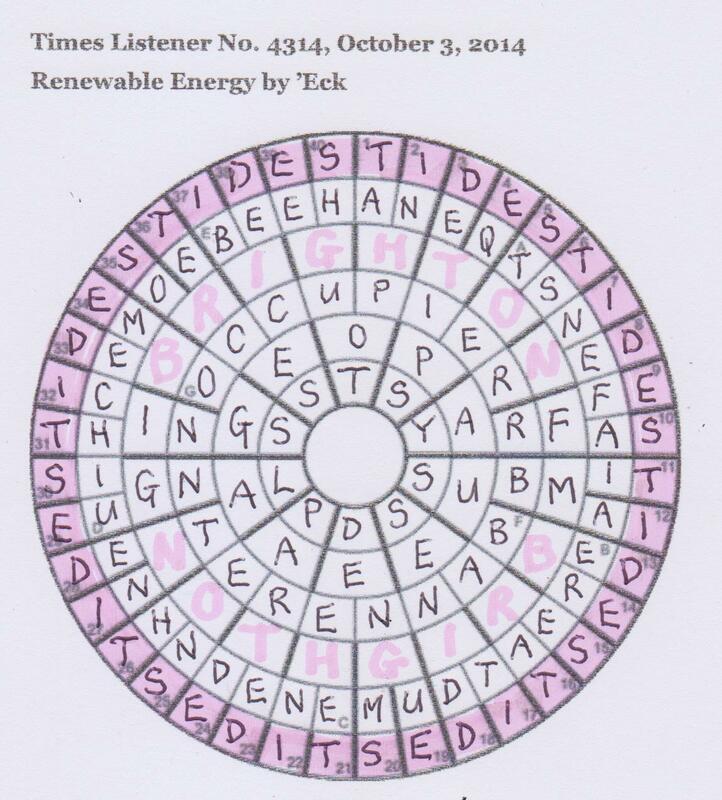 Here there were just ten clues to be wary of, each missing one letter in the wordplay. 7ac SLEET came first and I am somewhat mortified that 10 Before an age that’s ultimately become electronic (3) initially baffled me despite its relative simplicity — ERE. I was lucky with 11ac Moment in play regularly done as farce (9), as PANTOMIME popped into my head courtesy of ‘moment’, although I had never thought of a pantomime as a farce. A check with Chambers provided “a play or an entertainment in mime;” followed by what must be one of the longest definitions in the BRB: “a theatrical entertainment, usu about Christmas-time, developed out of this, no longer in mime, with showy scenery, topical allusions, songs and star attractions of the day, buffoonery and dancing, centred loosely on a nursery story, formerly ending with a transformation scene and a harlequinade”! Finally it mentions farce. Unfortunately, the rest of the clues seemed to be slightly less easy. My initial scan of the acrosses yielded a paltry half dozen more. These included 34 More fragrant vin rosé, though not very fruity (for Californians) (6) for NOSIER (VIN ROSE – V)* and needed me to look up ‘fruity’ to see that it’s “crazy (US inf)”, the anagram indicator here. I’ll leave it to others to discuss the validity of the acute accent in rosé! The downs were equally slow in coming, although I finally got my first of the ten wordplay-minus-a-letter clues at 30: Bit of fruit squeezed into apple puree in turn (6) which was DRUPEL, the D being omitted. Slowly the grid filled, my favourite clue being 13ac Carrying a weight, terrorist drops food container (5) for [bin] LADEN. 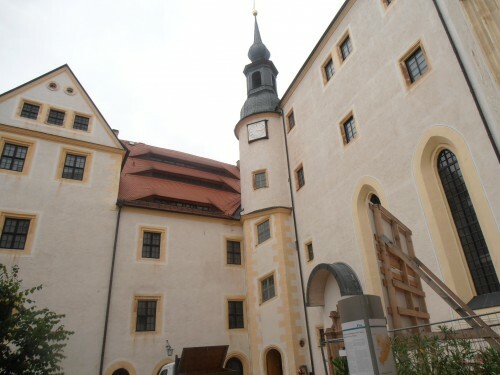 The letters omitted from the wordplay spelt COLDITZ and the RIVER MULDE could be seen flowing beneath it in the bottom row. We thus had to find four “companions” who escaped successfully and made a “home run” (hence the title). Although I knew of Major Pat REID, who is mentioned in the Brewer’s entry for Colditz (and was lurking in one of the NW–SE diagonals), I hadn’t heard of the others. I could see Lieutenant Commander William STEPHENS in the last column, as well as Flight Lieutenant Howard WARDLE in alternate letters of the top row, courtesy of the rather explicit wording of the preamble. Those three accounted for the 4-, 6- and 8-letter words, and it didn’t take long to identify the ten letters of Major Ronald LITTLEDALE in the first column. A few snips with my scissors and my grid finally resembled a castle, although, I have to say, nothing like Colditz Castle which didn’t have battlements. Nonetheless, thanks to Dysart for an entertaining puzzle, celebrating our heroes’ successful escape from Colditz in October 1942. 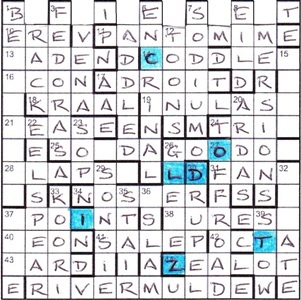 I wonder whether we were the only solvers to immediately decide that this crossword was going to be about Odysseus and three of his companions – maybe the unclued light was going to be some geographic feature encountered in the Odyssey – nice bit of subterfuge there, Dysart! Isn’t it intriguing that almost every Listener setter incorporates at least one clue referring to alcohol or drunkenness! (And, of course, Dysart qualifies emphatically for the tipplyListenerSetters.org with his very first clue, ‘Cleared up and started imbibing a drop of aquavit (6)’ (giving FARED round A[quavit]), his follow up where he was mixing his drinks, ‘More fragrant vin rose, though not very fruity (for Californians) (6)’ (VIN ROSE less V* – an intriguing use of the anagrind ‘fruity for Californians’ which Chambers tells me means ‘crazy’ though the fruity wine we were sampling in a Californian vineyard just a few days ago was far from crazy), and naturally, by the end of his clues, there was quite a gang imbibing, ‘Fifteen Scots relish drinking time (5)’ (15 – STEP had been our first word to go into the grid so we quickly recognised that it was acting as the definition here and we needed to put T[ime] into SAIR – Scots for ‘relish’). Another clue cross-referring to a second one appeared at once, ’11, after dismissing buffoon, played perfectly (6, two words)’ (We had to remove MIME from PANTOMIME leaving PANTOE, which, of course, when ‘played’ or anagrammed giving us A POINT, produced (or failed to produce) one of the letters missing from the wordplay, the I). Of course, those four names were apparent in our grid when we realized with relief that the mutilation we had to perform was merely the alternate letters of WARDLE’s name, leaving a fine set of crenellations at the top of what would have looked even more like a castle if we had been instructed to cut out the other names. But no, ’empty cells’ were spoken of, so we had to merely erase the letters of REID, LITTLEDALE and STEPHENS. One task left to perform, the highlighting. Oh dear, that took me as long as the rest of the solve as I was unsure which O of GOODOH to use, and, at first, unable to produce ten affected clues (having decided that LD (Ld = Lord) was the Lord caged in ‘Move on after caging Lord Glencoe’s bird of prey (5)’ (GEE round D – Dominus, Latin for Lord). I slept on that one and woke to the realization that the sneaky ‘of’ in the OFFROAD clue was part of the definition ‘of vehicles designed for tracks’, and my problem was solved. It wasn’t until I was copying out my solution that I realized, first, that the grid was not symmetrical, and second, why. What an astonishing feat Dysart had performed to produce only real words after the characters were removed! Great fun, thank you, Dysart. Oh, my giddy aunt! What a lot there is going on in the preamble. Misprints in every clue — half in the definition part and half in the wordplay — clues needing to be amended before solving, and 16 clashes — yes, 16! And all this from a new setter who has, as far as I can see, only one Inquisitor to his name back in January. At least we were told that definition misprints were to be entered in one direction in the grid (inwards or outwards) with wordplay misprints entered the other way. What’s more, the puzzle appeared while I was on holiday in Portugal, and it wasn’t until a week after publication that I could collect it from a friend. I hoped that the puzzle itself wasn’t as complicated as the preamble. So, here I was on the Monday before the Thursday deadline with a blank circular grid in front of me — yikes! My first task was to determine the direction for the two misprint types. That would mean finding one of each type next to each other, so a quick scan of the clues was in order. 5 Sandra, spy, securing European society platforms in Cape Town seemed to be shouting out STOEPS, although how ‘Sandra, spy’ could lead to STOP was a mystery and so was probably one of the clues needing adjustment. 6 was STREST (I think), and 9 Spawn — Neil (radiant) admits they made it being fearful of prior generations seemed to be EFFRAYED, even though it had too many letters. Perhaps it was EFFRAY, with Neil being redundant in the clue; still not quite right though. While I was pondering this difficulty, it struck me that there were an awful lot of first names in the clues. So far, three were affected, and I could see that there were three more names just in 10 — Lois, Nico and Norma. I decided to have a quick foray into the ring clues. The preamble said that A–E needed to be entered jumbled, together with an extra letter given by the wordplay. 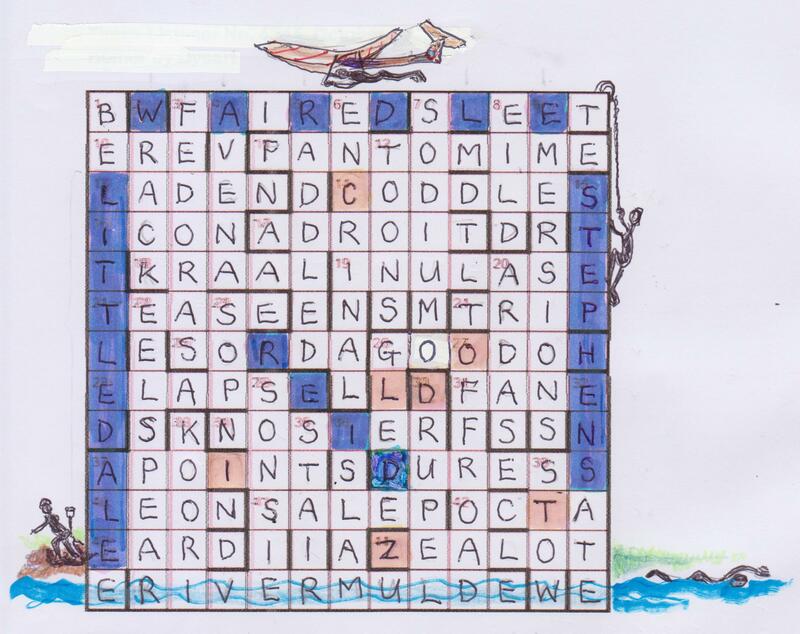 Clues F and G, while still providing an extra letter in the wordplay, were entered normally. F passed me by, but G Tenant to come to pass around fish (8) looked as though it could be RESIDENT, but the wordplay didn’t back it up. I scanned the remaining clues but didn’t get many, and some that I did get didn’t seem quite right. 21, for example, had Giggled support from Antony gets reward and looked like TEEHEED (too long) or maybe TEHEED (TEE too short)! Coming round to the top of the grid again, 37 IBICES, 40 TOUGHS, 39 TOUPEE, 1 TOP-HAT and 2 INKPOT were slotted into place. G now resolved itself as OCCUPIER (OCCUR around PI[k]E). 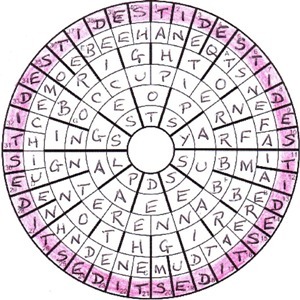 Moreover, along the top of the grid, I now had ··IDESTIDE·· in the outer ring together with a few other Ts, Is, etc. What’s more, they all fitted together to form TIDES eight times around the outer ring. Excellent! Having these letters certainly helped with the rest of the solving process because the clues were really tough with some devilish misprints. 39 was probably my favourite: Uranium concealer before uranium leak defined TOUPEE with ‘cranium concealer’! After about three hours, the grid was just over half full with the western quadrant almost completely empty. Did I mention that I was running up against the deadline? It finally dawned on me that there were too many clues where the answer just didn’t seem to fit the clue 100% — and they were all clues with names in them! On a whim, I tried anagrams of SANDRA and was rewarded with NASARD. I thought that was a beak, but a check with Chambers showed it to be ‘an organ mutation stop’. So at last I had my STOP in clue 5. The names didn’t get dropped from clues but had to be anagrammed. EFFRAYED at 9 was EFFRAY with RAY being defined by ‘line (radiant)’ and 10, with Lois, Nico and Norma, became In Yell they hate have soil for fuelling fight about coin for Roman was YARFAS — FRAY< + AS. Even ‘Tabitha of Madison’ made more sense as ‘Habitat of daimons’ — EREBUS, and the TE of TEHEED sounded like TEE spoken over the Tannoy! Some time later — this was a much longer than average solve — and the grid was complete, the misprint corrections giving “Look at me. I’ve never changed. 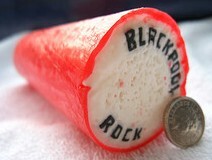 It’s like those sticks of rock:“. It needed Google to reveal that it was from Brighton Rock by Graham Greene — again (after The Third Man five weeks ago) which starred Richard Attenborough who died six weeks ago! Graham Greene was born on 2 October 1904. These words from Ida were in reply to Rose’s comment: “People change”. This explains why the names in the clues had to be anagrammed, except Ida in 30 — she “never changed”. She goes on to say “bite it all the way down, you’ll still read Brighton. That’s human nature.” It didn’t take long to resolve the clashes in the grid, all in ring 3, to give BRIGHTON twice. Finally, we had to “highlight 40 cells as cryptically suggested by the moniker of the character under discussion”. This was Pinkie (Brown), the character played by Attenborough, so it looked likely we were going to shade the outer ring (40 cells) pink — or brown! Of course, a bit more thought, and it wasn’t TIDES that appeared in the outer grid eight times, but ID EST (ie), so we had to shade them pink. I copied my rough copy onto my entry grid and highlighted the outer ring. Sadly, unlike my animation, I didn’t write the two Brightons in red/pink but in black, along with everything else. And so a really tough puzzle hit the post box. As a Listener newbie, this was a tour de force by ‘Eck with some fantastic clues and tons of thematic material. I look forward in anticipation to more puzzles from first-time setters, perhaps by Gum, by Jove or by Trial and Error.